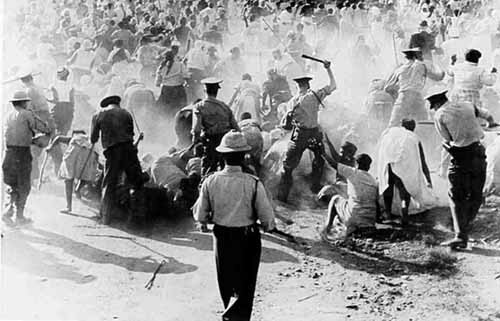 On Monday 21 March 1960 a sizable crowd gathered at a field near the Sharpville police station. Their intention was to march to the police station and hand themselves over for arrest for not carrying their pass documents. The action was in response to the call made by Pan Africanist Congress (PAC) President, Robert Sobukwe, at a press conference held on Saturday 19 March. Speaking at the press conference, Sobukwe had emphasised that the anti-pass campaign should be conducted with the spirit of absolute non-violence. The African National Congress (ANC) had announced at its annual conference on 16 December the previous year – that 1960 would the, “Year of the Pass”. The PAC, a splinter-group from the ANC, had held its inaugural conference a week later and announced it would launch its own anti-pass campaign. In early 1960, both the ANC and PAC went on a drive to prepare members and the community for the nationwide campaigns. Having gathered a sizable crowd of people that Monday morning, local leaders led the march to the Sharpeville police station. They were met by a heavy layer of policemen lined up outside the police station with many more positioned on top of armoured cars. Undeterred, members of the branch executive moved forward and demanded to be let through so they could surrender themselves for refusing to carry passes. The police commander refused but later capitulated. Slogans and freedom songs rang out as marches raised their voices in jubilation. Journalist rushed to Sharpeville after receiving word the the campaign was a success. It is estimated that a crowd of about 5 000 had gathered outside the police station by midday and along with it about 300 armed policemen. An hour and fifteen minutes later, a scuffle broke-out around the entrance to the station. A policeman was accidentally pushed over and the crowd moved forward to see what was happening. One of the policemen atop an armoured car, got nervous and opened fire. His colleagues followed suit without warning the crowd to disperse. The rain of bullets last about two minutes. When it stopped 69 people lay dead, many more were injured. Police claimed the crowd had pelted them with stones without warning and that they had felt in grave danger. The evidence proved otherwise, however, as only three policemen were hit with stones while more than 200 protesters were shot down – mostly in the back. Claims by police that the crowd were armed with ferocious weapons did not bear out in the photographic evidence. Today as we celebrate Human Rights Day – NEVER FORGET.